The high-quality, Personalized Leather Gifts in this section have no minimum quantities and most include a gift box! Each unique leather gift features an optional monogram or initials. Looking for men's & women's gift ideas? Check out our high quality leather wallets. Zippered portfolios in a variety of styles. Add your initials or monogram for a special touch! Fine leather binders, portfolios, note pads, planners, address books and jotters - most can be personalized! A very special gift in both men's and women's styles. Shop for leather business card cases and holders in a wide variety of styles. Fine leather briefcases and laptop cases. Add names or initials for that special touch! Fine leather sports bags and gym bags. 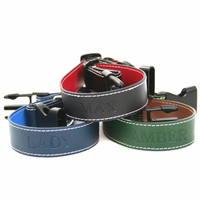 Personalized Leather Dog Collar or LeashDurable high quality Genuine Leather dog collar will look striking on your beloved pet. Made for small to medium size dogs, the collar is adjustable (13"-19" length and 1" width). Travel Photo AlbumHolds up to 40 4" x 6" photos. Fine leather. Mini Leather Jewelry Box with Removable PouchHigh quality leather case with interior (removable) drawstring pouch, two small pockets and ring holder. Leather Deluxe Toiletry BagOur top grain Napa cowhide toiletry bag is perfect f or all your travel needs. This traditional design features a convenient interior pocket and waterproof lining. Leather Ladies Cosmetic Travel CaseA waterproof lined Napa leather case that features a bottom compartment with see-through zippered pocket, main compartment includes three travel size bottles and a zippered pocket, plus and extra pocket. A neat way to travel! Women's Leather Manicure SetPerfect for your purse or overnight bag, our ladies manicure kit includes a cuticle nipper, cuticle pusher, fingernail clipper, scissors, tweezers and covered nail file in a zippered Genuine leather case. Leather Ladies Travel Manicure/ Cosmetic SetA Nappa leather well-rounded cleverly designed case with 4 cosmetic brushes/applicators, nail file, tweezers, cuticle trimmer, 2 way cuticle instrument, eyebrow tweezers, cuticle nipper, scissors, finger and toenail clippers. Leather Zip Around Poker CaseThis handy poker set is perfect for the traveler or commuter. Includes 2 decks of professional quality playing cards, score pad, pencil and 5 dice all neatly assembled in a beautiful zip around Ultra Bonded leather case. Napa Leather Valet Key FobThis sturdy, top grain Nappa leather double key fob detaches on one side to make valet parking a snap. Leather Wallet With Removable Key RingTop Grain Nappa Wallet with detachable leather key ring, oversized photo/ID pocket, zippered change pocket, credit card slots and an exterior pocket. 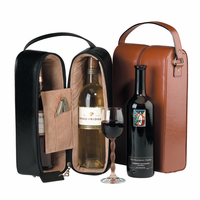 Leather Connoisseur Wine CarrierThe essential case for the wine enthusiast. This Ultra Bonded leather case has a plush, padded interior and features a removable/adjustable separator, two acrylic wine glasses, and a stainless steel corkscrew. Complete with adjustable shoulder strap. Leather Single Wine Presentation CaseWhen it's time to break out that prized bottle you've been saving, make the occasion all the more memorable with this elegant Genuine leather and suede lined wine case. Complete with stainless steel corkscrew and bottle opener. Leather Garment CoverTop grain Nappa cowhide lightweight, roomy and ready to go. Perfect for shorter trips. Fabric lined to protect your clothes. Storage pockets for all you necessities. Outside zippered compartment. Leather handles and shoulder strap with pad. Leather Carry-On All leather SuiterA true classic performer! Soft natural top grain Nappa cowhide leather garment bag with two front pockets, two back pockets and two interior pockets. Will hold several suits and features a "Wally clamp". Complete with shoulder strap. Leather Deluxe Shoe BagProtect your golf and fine leather shoes with this top grain Nappa cowhide leather case, featuring "faux fur" lining and waterproof zippered pouch. Leather Mini-Manicure SetFeatures chrome plated implements including scissors, toe and fingernail clippers, knife and covered nail file. This zippered Genuine Leather case fits nicely into purse or attach_. Leather Deluxe Chrome Plated Mini-Manicure KitChrome plated, mini-manicure kit includes a pair of hot -forged scissors, nail clippers, knife and covered nail file in a zippered top grain Nappa cowhide travel case to go anywhere. Leather Framed Manicure SetOpen up this beautiful top grain Nappa leather covered framed case to reveal scissors, tweezers, covered nail file, cuticle trimmer, fingernail clipper and knife. Everything you need for your manicure, case closed! Leather Clip-On Golf Accessory BagTop grain Nappa leather bag for the golfer. Features 5 slots for tees, zippered pocket for divot tool & ball markers, Velcro closure for your valuables, back has a framed window pocket for scorecard and a pen/pencil loop. Pewter swivel clip on top. Leather Mouse PadBring style and class to your computer. Your mouse will glide with ease over this smooth top grain Genuine leather top, anchored with a non-slip bottom. Leather Magnetic Money ClipClip your cash in style with top grain Nappa leather Magnetic Money clip. Large Magnetic Money ClipWe've taken our popular magnet money clip and enlarged it to cover your cash. Made from our finest top grain Nappa Leather, this larger version also sports brass corners and larger magnets. Leather Tray Coin HolderOpens up to a handy Genuine leather tray, allowing easy access to coins, The inside flap covers a small pocket for currency or keys. Leather ID Wallet CaseA snappy, classy little top grain Nappa leather case for your coins, currency and keys with a convenient ID window, zippered outside pocket and snap-close frame. Leather Deluxe Photo FrameSeamlessly constructed in Top Grain Nappa Cowhide Leather, our 4 x 6 photo frame will enhance your precious photo. 5 X 7 Single Picture FramePadded top grain Nappa leather 5 x 7 frame will hold your precious memories close, no matter where you are. Leather Single 4 X 6 Picture HolderTake your friends or loved ones wherever you go with this top grain Nappa leather picture holder. Finished with fine stitching around the edges, it beautifully frames your 4 x 6 snapshot. Leather Double 5 X 7 Picture FrameTake your friends or loved ones wherever you go with this top grain Nappa leather picture holder. Finished with fine stitching around the edges, it beautifully frames two standard 5 x 7 snapshots. Leather Double 4 X 6 Picture HolderTake your friends or loved ones wherever you go with this top grain Nappa leather picture holder. Finished with fine stitching around the edges, it beautifully frames two 4 x 6 snapshots. Leather 4 X 6 "Brag Book" Photo HolderJumbo photos (up to 40) are protected in vinyl sleeves and the soft, supple top grain Nappa leather case is secured with a leather strap. Leather Envelope Photo HolderSecurely take up to twelve 4 x 6 photos with you where ever you go in this handy top grain Nappa leather envelope. Leather 5 X 7 "Brag Book" Photo HolderNow you have a place to store your memories! 40 photos are protected in vinyl sleeves and the soft, supple top grain Nappa leather case is secured by a leather strap closure. Leather Deluxe Tie CasePadded top grain Nappa leather exterior, gold tone hanger and leather straps that hold up to six ties. Also featured is a small leather zippered pouch, perfect for storing jewelry and accessories. Leather Deluxe Nano IPod CaseNestles your Nano in top grain Nappa cowhide leather with a velvet interior, flap over cover with a snap closure keeps it safe and secure. Attaches to your clothes with a leather covered clip. Leather Deluxe IPod CaseMade from top grain Nappa cowhide leather, this beautiful case keeps any version of IPOD safe and secure. Personalize for that special touch! Leather Mini IPod CaseThe perfect cover to keep your mini IPOD cradled in soft top grain Nappa cowhide.� Flip over top has a slip pocket for some spare cash, easy access to the dial and window, leather covered clip on the back to secure it to your pants or clothes. Leather Double Pen CaseTop grain Nappa leather double pen case with padded tuck-in flap, protects pens and clothes. Leather Single Pen CaseSoft top grain Nappa leather case for that fine writing instrument. Napa Leather Jewelry RollThe three lined, top grain Nappa leather zippered pockets offer plenty of room to store your jewelry. Features a soft suede lining with a ring bar and multiple earring station. Leather Sweetheart Everything Box (Personalized with Name or Initials)Hold everything from Jewelry to pictures to those treasured mementos. Our top grain Nappa cowhide leather sweetheart everything box, with a solid lid, perfect for personalization with a diamond engraved plate or debossing. Leather Sweetheart Jewelry BoxTwo slide out earring trays, two deep pockets for necklaces, a ring and hoop earring section which lifts up to reveal a hidden compartment for necklaces. Men's Leather Stud BoxSecure your valuables at home or away with the snap closure Men's leather jewelry box. Compartment to keep watches, cufflinks or bracelets and comes complete with three sets of the always illusive collar stays. Mini Leather Jewelry CaseCute and compact, this zippered top grain Nappa leather case with a ring bar, two snap pockets for bracelets or chains and a removable drawstring pouch. Ultra Bonded Leather Mini Jewelry CaseCute and compact, this zippered Ultra Bonded leather case with a ring bar, two snap pockets for bracelets or chains and a removable drawstring pouch. Leather Ladies Pocketbook Jewelry Case (Nappa Leather)Clever top grain Nappa leather styling and compact design make this case a treasure! This novel case opens to reveal four hooks and a pouch to hold chains or bracelets and much more! Men's Leather Watch And Jewelry CaseTime for a man to have a great place to store his valuable watches! Plus, this top grain Nappa cowhide leather case has two ring bars, two scoops for pocket change and a slide out drawer for chains, rings, cuff links and accessories. Leather 5 Slot Watch BoxGenuine Leather exterior with a view through top, soft velvet interior with 5 slots and cushions for your fine watch collection. Leather Deluxe 5 Watch BoxTop Grain Nappa Leather surrounds this elegantly crafted watch box. A glass topped case to view your collection, 5 velvet pillows to cradle your favorite watches, and a keyed lock to keep them secure. Leather Palm Pilot CaseA touch of class without clutter. Premium leather case has sheath for stylus, extra pocket for paper, slot for cards and a Velcro closure. Leather Automobile OrganizerTop grain Nappa cowhide leather organizer holds your insurance card and registration, a pen, tire gauge and flashlight. Features a zip first-aid compartment and pockets for maps and your auto handbook. Batteries not included. Leather Glove Compartment OrganizerKeep all your car manuals in one beautiful Genuine leather case. Includes a large leather trimmed clear pocket on top to hold your Insurance card, 4 additional leather trimmed windows on the lower end for business cards and registration. Leather 10 CD Holder (Napa Leather)Top grain Nappa Leather, elegant and practical way to travel with up to 10 CD's or DVD's. Leather Luggage TagsTop grain Nappa luggage tag in a unique design, with a snap to hold the privacy flap closed. Leather Snap Luggage Tag (Napa Leather)Top grain Nappa cowhide leather luggage tags with a convenient privacy flap and gold- tone buckle. The Big Luggage TagFinding your luggage is easy with the big tag. Top grain Nappa cowhide, strong lobster claw rotating claps hooks securely to your luggage, privacy flaps keeps you information from prying eyes. Leather Luggage TagDeluxe, top grain Nappa luggage tag manufactured in our fine quality leather to match our luggage items. Makes a great personalized holiday gift! Leather Bookmark with Photo HolderElegant leather bookmark holds 1 7/8 x 1 1/4 photo. Post-It (tm) Note HolderRise above the clutter with the classic beauty of leather! Florentine Napa - 5.8 oz. - 1 1/4 x 3 1/2 x 3 5/8 Available in colors: Black, Tan. 4 x 6 Desk Note HolderA Most Distinctive desktop ornament. Includes loose sheets of 4 x 6 paper. Florentine Napa leather. Leather Stash TraySnaps open to lie flat for travel in your suitcase, and also snaps shut and becomes tray for keys, rings or coins. Use at the office, at home or on the road. Leather 4 Slot Eyeglass Box / ValetTop Grain Nappa Cowhide leather exterior and a soft velvet interior will keep your eyeglass and sunglasses in a perfect setting out of harms way. Royce Leather 6" Screen Kindle CaseGenuine leather Kindle case with velvet interior lining. Royce Leather IPAD CaseGenuine leather IPAD case with velvet interior lining. Can be personalized. Replacement Pack of 10 To-Do List PadsReplacement Pack of 10 To-Do List Pads for Royce Leather Pocket Jotter (710-5). Replacement Pack of 100 To-Do List CardsReplacement Pack of 100 To-Do List Cards for Items: 702-5, 704-5, 705-5. Round Desktop Photo/Pen & Pencil BoxFashionable rounded pen/pencil holder with elegant contrast stitching. Desk Accessory TrayThis elegantly designed Genuine Leather tray is the ideal for keeping your paper clips and memo papers organized and handy. Executive Desk padAppropriate for any boardroom! Protects conference table from pen scratches. Business Card Holder with Suade InteriorKeep your business cards visible in this Genuine Leather Business Card Holder. Black, lined in beautiful Charcoal Grey Suede. Leather Mouse PadBring style and class to your computer. Your mouse will glide with ease over this smooth Ultra Bonded leather top, anchored with a non-slip bottom. Leather 4 X 6 "Brag Book" Photo HolderNo mater how large your family you'll have plenty of space for up to 40 jumbo prints. Photos are protected in vinyl sleeves and the soft, supple Ultra Bonded leather case is secured with a leather strap. The above sections above include a large selection of personalized leather gifts that can be embossed with your initials or monogram. Leather gifts are organized by section, for example personalized passport jackets, wallets, briefcases, business card holders and more. Personalized leather gifts are appropriate for many occasions, including birthdays, holidays, graduation and business events. Prices in many of the leather gift sections start at just a few dollars. All of the custom leather products we carry are discounted and are of a very high quality.